A Mother Daughter Film Worth Watching, Disney's Brave! I was super excited to have the opportunity to watch Disney's Brave. Not only do I love that this new princess is from Scotland, but I absolutely love how independent she is and how hard she tries to let it be known that she does not need a man, she's completely capable of taking care of herself. Brave is a thrilling journey set in the ancient and magical Highlands of Scotland and follows the heroic journey of the headstrong, young adventurer Merida. 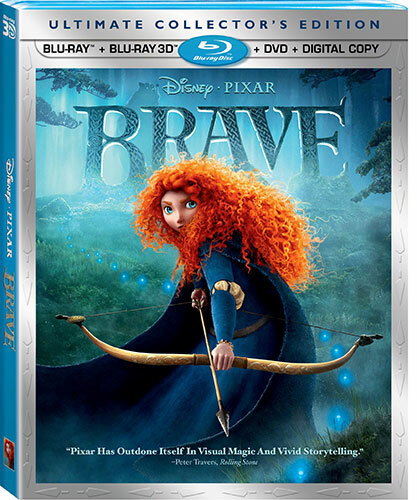 Determined to carve her own path in life, Merida confronts tradition and defies an age-old custom that inadvertently unleashes chaos, and forces her to discover the true meaning of bravery. More than anything I loved how the relationship between the Princess and Queen grew. Throughout the movie I have to admit I shed some tears. This is such a perfect movie for any mom and daughter to watch together, as one of my friends told me before I watched the movie, "It's kinder to the mother-daughter relationship than a lot of other kids movies are," I couldn't agree more. And that was something that drew me in more into the already great story. If you haven't already seen this movie, go get it now! It's out in stores and it's definitely a movie worth having. Disclosure: All opinions are my own. I received Disney's Brave for the purpose of this review. No other compensation was received.